The overnight air and artillery strikes killed an estimated 100 pro-government fighters near the Euphrates river, according to the US. It claimed a right to self-defence, saying it was responding to an attack on its coalition forces. The Pentagon said Russian mercenaries were also killed, but Russia denies having personnel in the area. The strikes happened in the Middle Euphrates Valley, which serves as an informal demarcation line in eastern Syria. The government controls the western side and the US-backed Syrian Democratic Forces (SDF) the east. The two sides have clashed over the past year while trying to drive Islamic State (IS) militants from their last major stronghold in the country. The US said the forces aligned with the Syrian government crossed the agreed line and launched an "unprovoked attack" on an SDF headquarters late on Wednesday, near the town of Khursham. It said 500 pro-government fighters, backed by artillery, tanks, multiple-launch rocket systems and mortars, were involved in the assault. Syrian news channel Al-Ikhbariyah said the bombing left "dozens of dead and wounded", and identified the pro-government fighters as "local people". The Syrian Observatory for Human Rights, a UK-based monitoring group, said they were local tribesmen loyal to President Bashar al-Assad and Afghan Shia militiamen. One member of the SDF - which is mostly Kurds and Arab fighters - was reportedly wounded in the incident, and there were no US casualties. A Pentagon official said Russian mercenaries were among the dead. If confirmed, this would be the first time US forces have killed Russians in Syria. However, the Russian Defence Ministry said it was only aware of 25 Syrian militia being wounded in the strikes, and no casualties. Did Russia give the 'green light'? The Pentagon said it had been in constant contact with Russia, raising concerns about a build-up of forces beside the SDF headquarters. US Army Colonel Ryan Dillon, a coalition spokesperson, told the BBC that Russia had assured them they were not involved, and so they felt free to launch strikes. "Everyday we communicate with our Russian counterparts so when this attack occurred they, the best way to say it is, gave us the green light," he said. US and Russian forces in Syria have a communications line open 24 hours a day to ensure that they do not attack each other. This is a matter of what the US military calls "deconfliction", not co-ordination. Initially the line - which has been supplemented on occasions by face-to-face meetings of more senior officers - was focussed on avoiding close encounters in the air. But increasingly - as IS has been rolled up - the "deconfliction" mechanism has been used to try to avoid contacts on the ground as well. The line was used prior to this latest incident - not least to ensure that Russian army personnel were not located in the target zone. To say, as the US spokesman did, that the Russians gave a "green light" to the operation is perhaps an exaggeration. 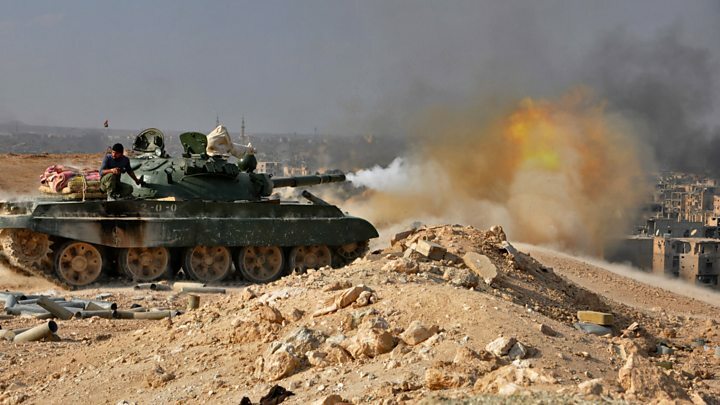 But, satisfied that warning had been given, the US engaged the pro-government Syrian fighters with artillery and air strikes, and this appears to have inflicted significant casualties. 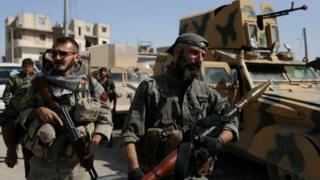 The Syrian foreign ministry said it had written to the United Nations, demanding international condemnation. It described the latest strikes as "a war crime and a crime against humanity", and said the US was directly supporting terrorism. The UN has called for a month-long ceasefire in the country, as violence escalates. Elsewhere in the country, Syrian forces have bombed the rebel-held Eastern Ghouta region, near the capital, Damascus, for the past four days. At least 201 people have been killed since Monday, according to the Syrian Observatory for Human Rights. The Syrian government has also been accused of using chemical weapons on a rebel-held town in Idlib province earlier this week. What is the significance of the oil fields? One US official told Reuters news agency that the pro-Syrian forces were "likely seeking to seize oilfields in Khusham that had been a major source of revenue for [IS] from 2014 to 2017", the official added. Both Russia and the US have accused each other of operating in the area to seize control of local oil operations. Before the war, the Omar oil field was producing 30,000 barrels of oil per day, while the Conoco gas field was producing 13m cubic metres of gas per day. What should happen to IS fighters?